Typing Chimp World guides you through the process of creating and detailing a complete story world. Using the latest technology, it's a cross-platform software package that offers simple yet powerful world-generating tools in an easy-to-use interface. The program provides questions and prompts to guide you through the process of creating complex and complete worlds. Starting with the Universe and how it came to be, to the Planets, Social Environment, and Population. Create as many planets as you want in your story world and define them all. 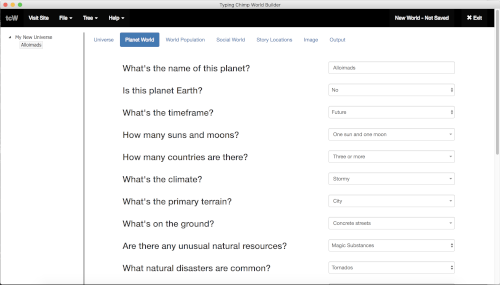 Quickly generate a complete world profile by answering structured questions from "how old is the universe" and "how did it form" to who populates your worlds to what are the actual story locations on these planets like. Once the questions are answered, World generates a complete world document for you to apply your writing skills to refine and build out. You can create as many planets as you like in one universe project document. Which makes it easy to keep World open while you write so you can refer back to your planets as you write your story wherever you do your writing. If you use Scrivener, use our built-in sync feature to send all your planet sketches to Scrivener so they are available there as you write. You could also just print or save them in MS Word to use there. World works great with any other program you're using. Structured questions for each area of development: Universe, Planet, Population, Social, Locations. Based on your answers, World generates a comprehensive World document. A quick reference system gives you professional guidance on concepts of world development. 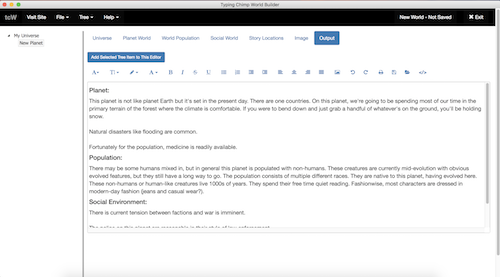 Export your planets to Scrivener for easy integration. Go back and edit in World and re-sync your planets with Scrivener. And the best part is that once you purchase this powerful world-development program, you can use it forever. There are no further fees, no in-app purchases, no subscription costs. You bought it. It's yours completely to use as much as you like, whenever and wherever you like. Boom. Click the button below to purchase and download the program. Thanks!